Large scale demonstration of harmonic motion. Help students see the answers to conservation of energy, vectors, and tension questions are right in front of their face. This classical experiment has been adapted to excite, engage, and intrigue students. A 5 lb. 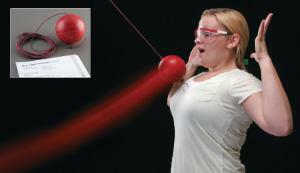 blowing ball is hung from a 25 ft. long rope with a breaking point of 500 lbs. Students hold this bowling ball to their nose and release it, with the goal to stay still as it returns just short of its initial position. For extra stability, the rope can be pulled through the ball and be hung by two ropes instead of one. A 5 pound lawn bowling ball is hung from a 25 foot long rope, the rope has a breaking point of 500 pounds.